Pinapaitan is one of those Ilocano dishes I love to eat but I can’t seem to get the taste right when I am the one cooking it. There are two pinapaitan versions I am aware of so far, one is the “bitter version“ which I believe is an original Ilocano version and the other is “bitter-sour version” which I am not sure if it is a non-ilocano variation. I like it either way. My husband Frederick though prefer the plain bitter version. My brother in-law, cooks delicious pinapaitan where the soup is dark green in color and thick, and has a bitter taste yet leaves an aftertaste that is somewhat sweet and sour . 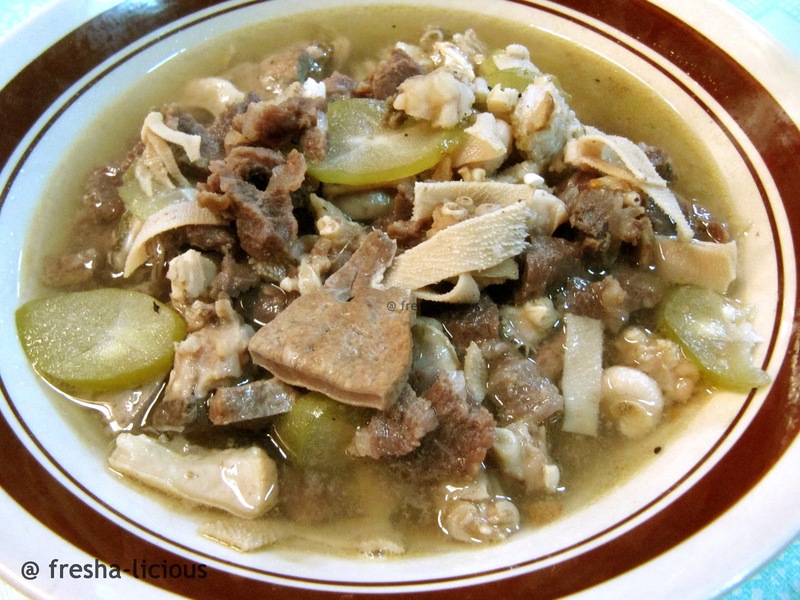 Pinapaitan is a “bitter” soup dish popular not only among the Ilocanos but also among Filipinos specially those from the Luzon areas. This dish is not for the squeamish and finicky eaters not only because of its bitter taste but also because of its ingredients / contents. In order for one to really enjoy and appreciate the exoticism of pinapaitan, one has to develop an acquired taste like with any other exotic foods. In our hometown Tabuk, kakarni-an (those who monger meat in the wet market) usually sell pinapaitan ingredients in bundles complete with the innards as well as “bitter juices”. Special pinapaitan includes both the pait and pinespes with a bile juice. During our first day in Tabuk I volunteered to cook pinapaitan. It was my first try, the ingredients are complete except for the missing pinespes, we only had the pait and a bit of the bile juice. My first try is short of the “bitter taste” and it didn’t taste as good as the one cooked by my brother in law so I have to cook another one for the second time around. My second try is better, as I have both the pait and the pinespes without the bile juice though. Anyway, here’s my pinapaitan version. It’s actually Pinapaitan soured with kamias because there is no kalamansi (small lime) available. Before slicing the beef innards make sure that you clean them thoroughly specially the intestines. Separate the sliced liver. Heat the oil in a pan and sauté the garlic until it turns brown then add the onions and ginger. Stir in the innards and meat except for the liver. Let simmer for at least 5 minutes. Add the liver and the green sili and let it simmer for at least 2 minutes.